I had fingers x'd that something might come on shore as there was some nice structure offshore. But when I looked west and saw a CU that looked like a hand with its middle finger sticking up I felt that was a good sign nothing was going to happen today. Yeah it was pretty disapointing wasn't it. There was some nice CU clouds to the west and then they just dispersed into nothing. 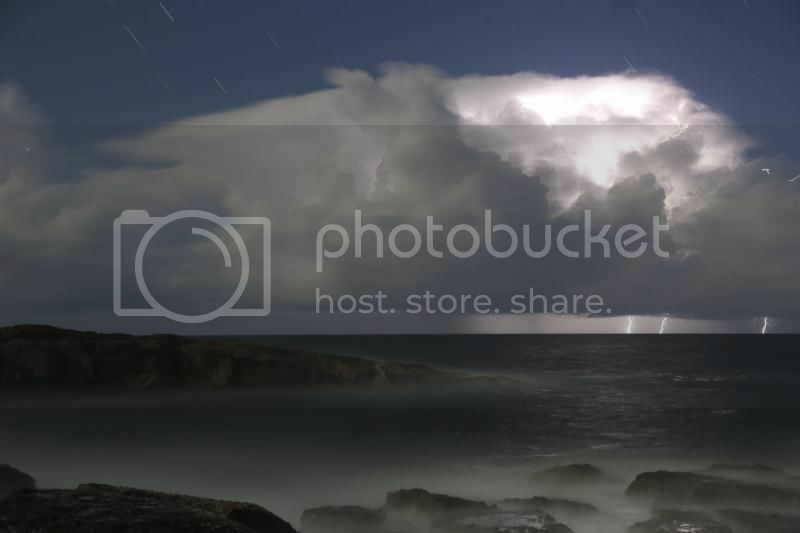 Those cells offshore from Kiama are bringing a spectacular light show down here. Looks like all you guys are having a bit of action. In Auckland atm and have had nothing but great weather here in NZ. Those towers off the coast have been visible for days now. From as far north to south as far as the eye can see. They've been quite spectacular. Yet, they've delivered bugger all. Not to the Sydney area anyway. Oh, well, it's been an interesting period. Just sat down at Lake Illawarra for an hour and watched these storms, it was absolutely amazing. Probably one of the best lightning shows I have ever seen! 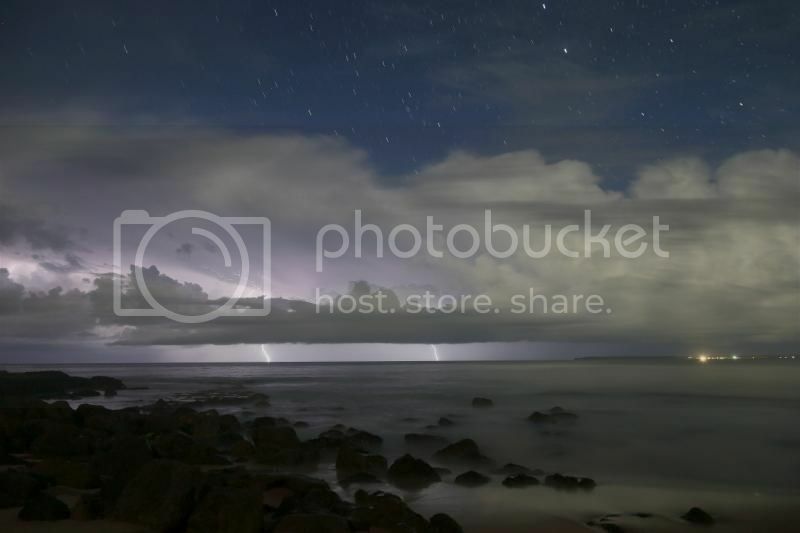 Some very bright flashes from the cells off the Illawarra and Shoalhaven last night. The CGs were beyond the horizon though, pity. It's no coincidence that the cells have been feeding off those bath warm SSTs just off the coast. The near shore temps are a bit lower at 22-23C, the 26.5C registered by the Sydney buoy was a false reading. Fifth day in a row of chasing around Canberra yesterday & probably my best ever chase if not anywhere, certainly in Australia. Morning charts showed a large amount of predicted turning through different levels of the atmosphere east of Canberra, with great lift, plus a mid to upper cold pool & some small diffluence in the uppers nosing in from the north. Watched a Snowy Mts storm develop between 1.00 and 2.00 pm & met Greg Sorensen shortly after 3.00 pm at the new lookout at the National Arboretum and we gazed south west to this storm. We also watched development to the east of Canberra, which initially consisted of cells going up reaching just above the mid level and falling over, but as time went on they became stronger and the bases below them began to fill out accompanied by some surprise early CGs. For a short time we were tempted to chase some development on the northern end of the original Snowy Mts storm, which we thought might approach NW Canberra, but we gave that notion away because it hadn't crossed the Brindabellas, which are notorious storm killers. 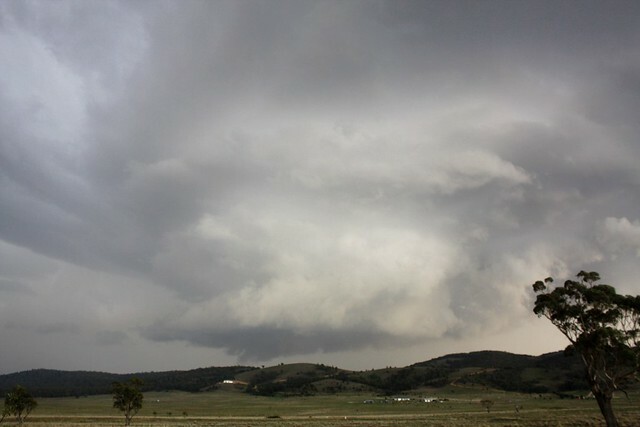 Greg had a dinner engagement so at about 4.30 pm I took off east and was pleasantly surprised by lots of strong updrafts over and east of Canberra as I headed for Bungendore. At Bungendore I took a call from Greg telling me of lots of development south and east of Bungendore which I confirmed visually. 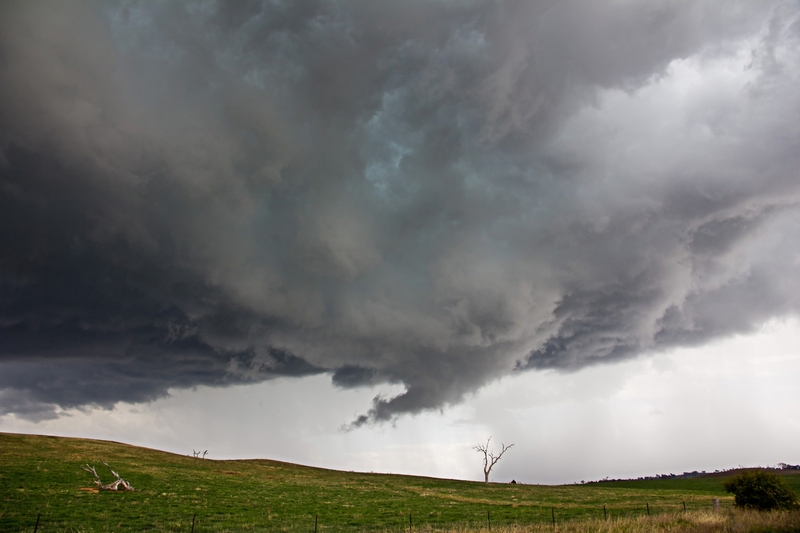 Just east of Bungendore, I was encouraged by clear separation between bases and rain curtains & turned off the Kings Hwy and traveled north towards Tarago, pushing through heavy rain till it was clear near Tarago and a nice lowering appeared. 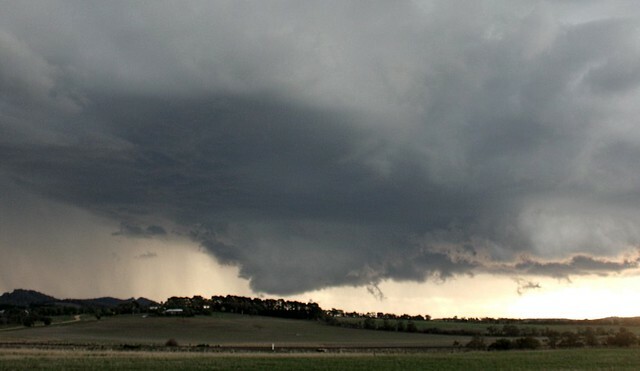 I was tempted to stay in Tarago and remembered, in the past, other chasers had gone to a lookout near there, but I couldn't find it so I proceeded to nearby Lake Bathurst, where I knew there was an elevated area for viewing. Getting there just after 6 pm, with no other cells to the north and east making light conditions excellent, I saw this fantastic sight, which had developed to the south of me, probably between Tarago and Bungendore. I tried to get to the top of the hill to get a clear unimpeded view south, but gave up and headed back to just east of the village of Lake Bathurst and saw this jaw dropping structure and meso, which seemed to be on the verge of becoming outflow dominated - again this appeared to be located to the south of Tarago. This was just after 6.30 pm. While about to head north, I caught sight of this scene, a couple of kms away to the WSW, on top of the hill, I referred to earlier. A new meso had developed, put down a wall, and very, very likely a tornado was in progress, which I photographed for 10 - 15 minutes. Both this sight and the previous delicious looking meso were things I had never seen in Australia before. The strongly suspected tornado looked multi vortex from time to time, and I was somewhat concerned for the residents of Lake Bathurst, so I attempted to alert a local who could spread the news, but no one answered their door. After this I ventured back up the hill but the development was now only a prominent wall cloud. I then proceeded north to Goulburn, running into chasers Jimmy Deguara, Simon Angell, Stephen Jarrett and Ben McBurney. Before heading for the Federal Hwy, I checked radar to see if there were going to be any night time nasty surprises and on the journey back to Canberra encountered some flowing water over the highway. 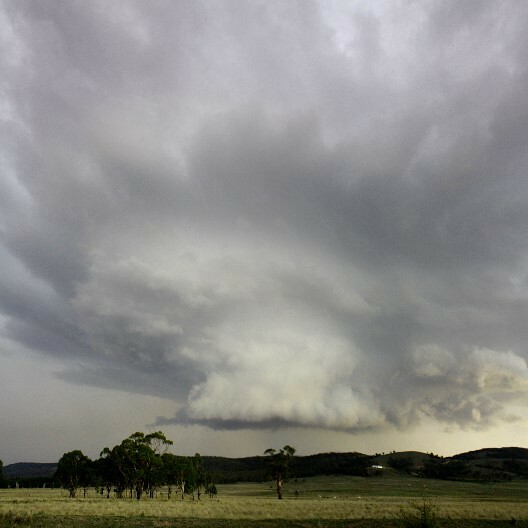 Thanks to Greg for the updates and I agree with his idea that strong outflow from the Snowy Mts storm as it fell apart when it reached the Brindabellas added more fuel to the Tarago - Lake Bathurst supercell. Great reports, pic and vids!! 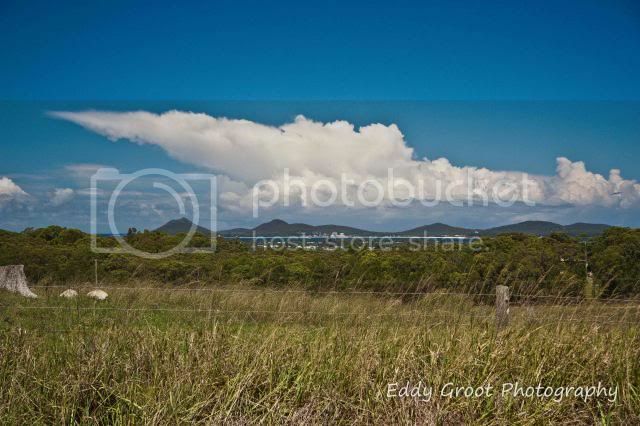 Took this pic on the way back from the highway, was checking to see what was happening around Bulahdelah, radar suggests it raining up that way, can tell you its not raining, very little in the way of cloud let alone rain!! 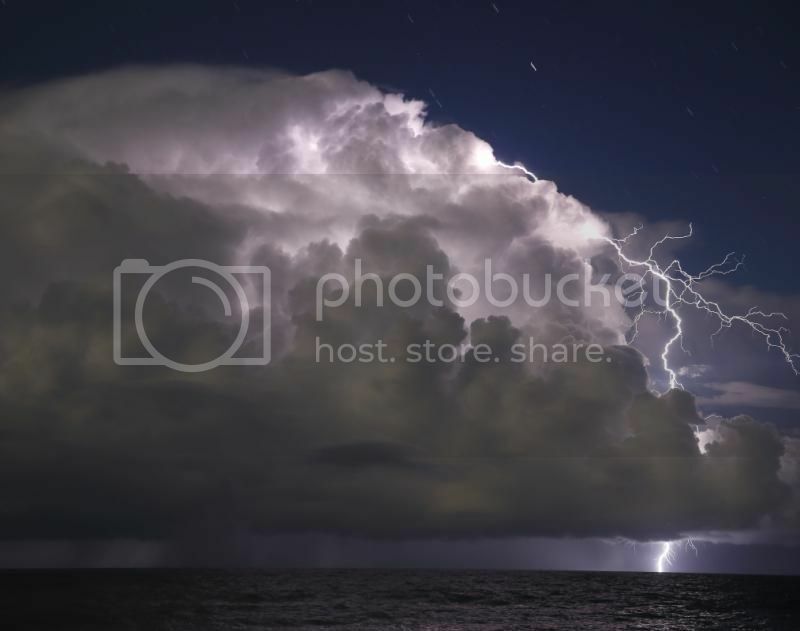 Last nights lightning show off Culburra was spectacular, and my best offshore show since 2007... The temptation to chase on the Southern Tablelands was high, however I wanted to get a game of golf in with my dad and there was always a high chance of an offshore lightning show anyway. I hit the coast about half an hour before sunset . 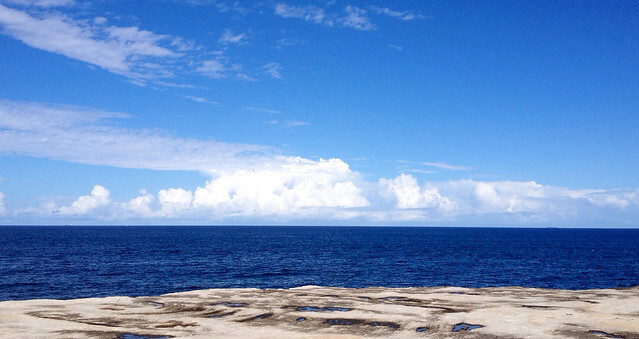 The sunlit congestus towers and storms 50kms out to sea looked amazing, and was a sign of things to come. 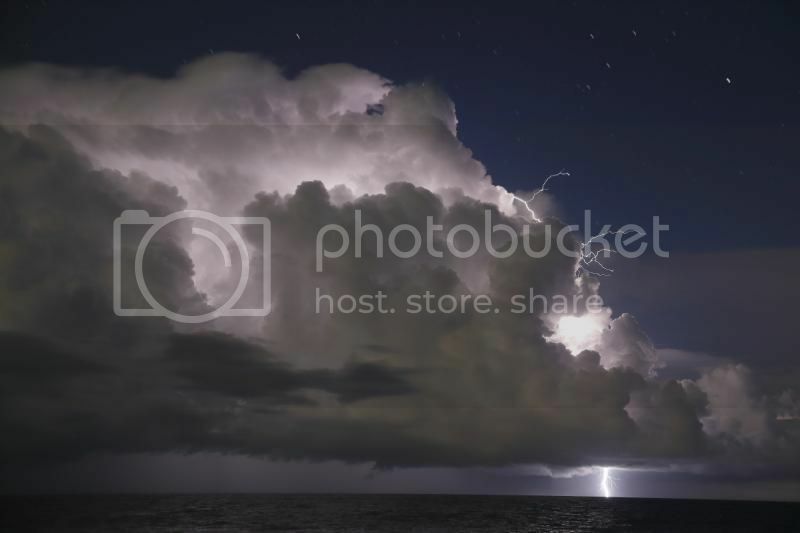 As the skies gradually became darker , flickers became visible and also the occasional cg. The first lot of storms moved off well to the south east, however a new congestus tower built to my northeast and this became lightning active very quickly. It proceeded to drop numerous cgs including a couple of very impressive clear air cgs. 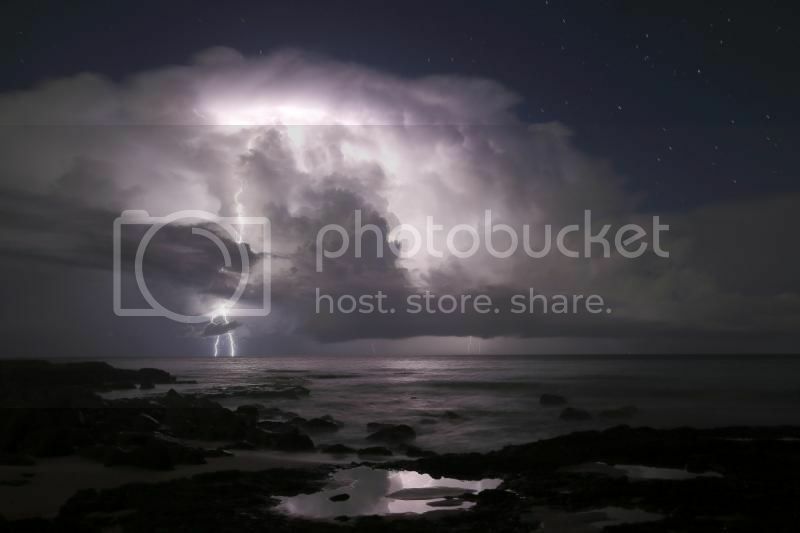 (see below) The storm wasn't far out to sea either, maybe 30kms, and the occasional loud boom could be heard. The storm was very active for a good half an hour with numerous clear air ccs dancing away at the top of the tower. The large clear air cgs stopped, however there were plenty of standard cgs to be had. The storm moved a little further out, and the lightning rate dropped , however there were still some pretty cgs about. Some spectacular shots there guys!!! Such a shame this system couldn't have been 50 k's to the west!!! Day after day of storm activity off the coast. Thanks to all that have posted such brilliant pics ! 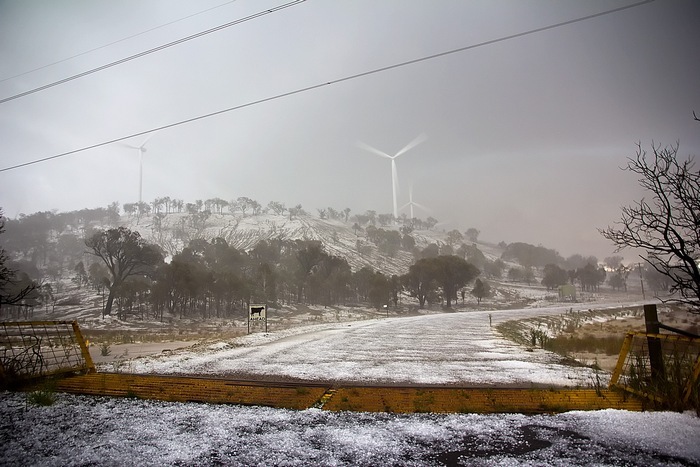 I chased Saturday, bagging the hailstorm near Gunning while it was still a rain free base. Ground zero under the updraft just before it cut loose . And the video....features some early isolated lightning, then some time lapsed cloud movement, before the hail. 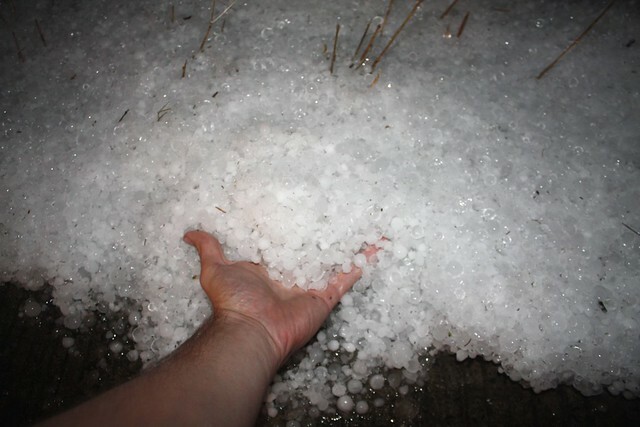 The hail became so heavy that I worried that I may be trapped as I was 5km down a poor dirt road (to access those wind turbines), and sluices a water/debri/hail were just starting too come down the hillside. 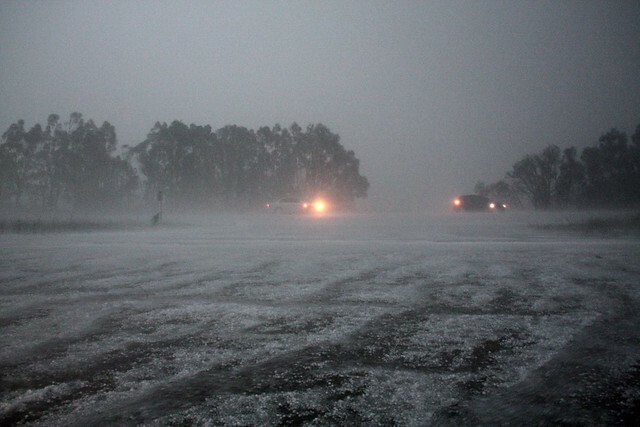 Great shots Ozthunder, the formation of the storm and the amount of hail there is truly spectacular! Here's an unimpressive pic from yesterday! 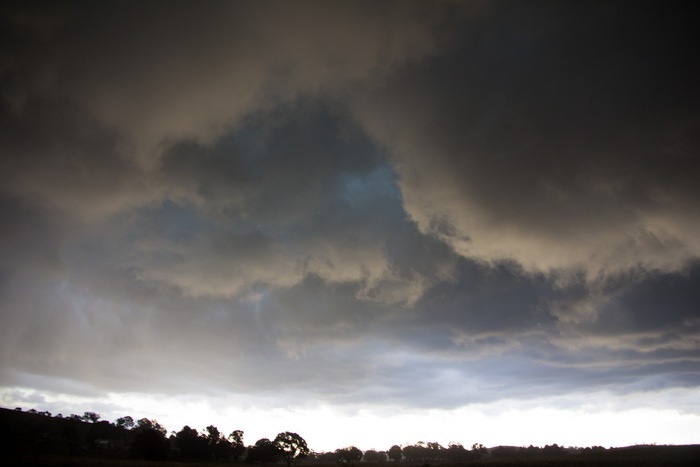 The boiling sky to my east during Sunday's excellent thunderstorms. Great pics and video all. Here are some of my pics! and great to be living off another states action. was getting too familiar with the SEQ crowd. Great photos Ben and Ant!! 5 registered (Eigerwand, SteveB93, Timbuck, Multiversity, Mike Hauber), 55 Guests and 3 Spiders online.